These were really crunchy Kettle Chips. They were not hard and brittle, or overly firm like some. Neither were they soft and smashable like some regular Chips. The crunch was sustained until a whole Chip was eaten. This was a really well executed, characterful bag of Kettle Chips. They did not look or feel greasy. There were lots of bent and folded Chips, but not many rabidly curly Chips from over cooking. The color was an even, fairly unblemished yellow potato color. Best of all, they looked like they had a disease; there were so many black spots. The Nose Plunge Test revealed absolutely nothing, which was strange because upon looking into the bag, it was absolutely covered in flecks of black pepper seasoning. 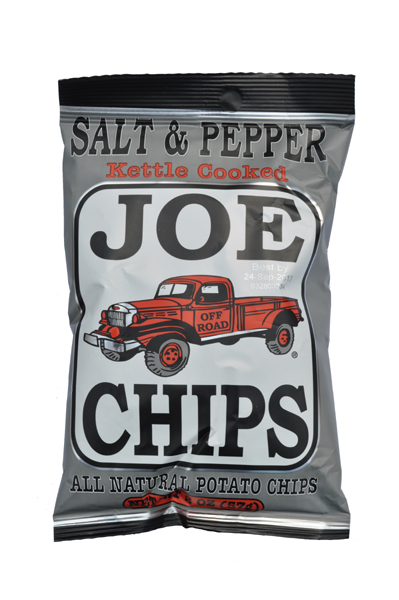 The odd thing about these Chips was that they had a lower sodium count than Joe's other Chips. As it was part of a flavoring combo, this struck us as strange. It was also noticeable in the flavor, which was a mild, but warm potato flavor, mixed well with Pepper. Although effectively Pepper flavored, these Chips were really enjoyable.